In 1957, Smale proved that a sphere can be turned inside out, without any tears, sharp creases or discontinuities, if the surface of the sphere is allowed to intersect itself. Since Smale's proof, a number of explicit eversions of the sphere have been discovered (Shapiro, 1961; Phillips, 1966; Morin, 1967; Thurston, mid-seventies). *Based on a software program by Nathaniel Thurston developed at The Geometry Center, University of Minnesota. Used with permission. 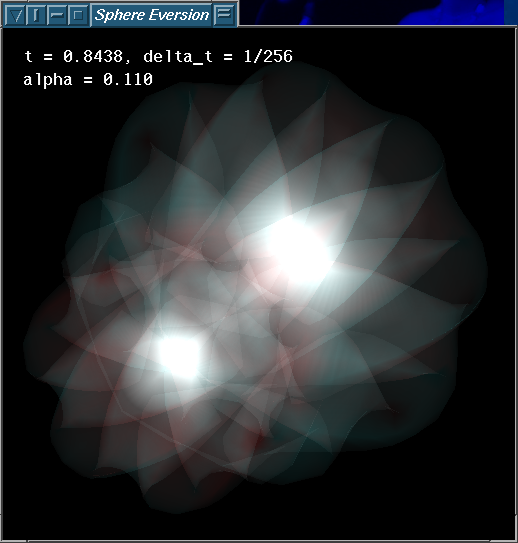 Update (Feb 2005, version 0.4) : I have ported sphereEversion to GLUT, so that it now runs on MS Windows. I have also added support for alpha-blending (semi-transparency). Version 0.4, executable for MS Windows: sphereEversion-0.4-exec.zip Consult the included README.TXT file for instructions on running. 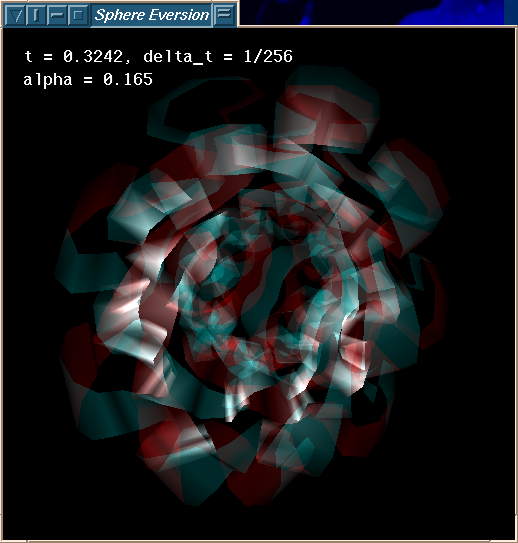 Version 0.4, source code: sphereEversion-0.4-src.zip Runs on linux, MS Windows, and other platforms. Written in C++. Requires OpenGL, GLUT, STL, POSIX. Update (Oct 26, 2001, version 0.3.1) : Jamie Zawinski helped me add a root window mode (enabled by running sphereEversion with a --root flag) so that sphereEversion could be invoked by xscreensaver. Version 0.3.1, source code: sphereEversion-0.3.1.tar.gz Runs on a Unix/X11 system. Requires OpenGL and Xlib. Update (Nov 27, 2000, version 0.2) : Many thanks to Ralph Giles for providing a patch that makes sphereEversion easier to compile on a GNU/Linux box. Disclaimer: Use at your own risk. The software on this webpage is provided "as is" and without warranty of any kind, either express or implied. The starting point for this project was the source code for a program called evert, available from The Geometry Center of the University of Minnesota. evert was written by Nathaniel Thurston, and is based on ideas of Bill Thurston. evert is a program that computes a description of the 3D geometry of an everting sphere at a given point during the Thurston eversion, and spits out this description into a text file. To make the sphereEversion program, I had to slightly hack the source code for evert, and then I wrote an OpenGL layer on top of it to render the everting sphere in 3D. spot pinch points as you see the evolution. If you are aware of the minimum number of strips, I would be interested in hearing from you. Here are some related sites on the web. These are screen shots of sphereEversion in action. The screen shots below are from an older version (<=0.3.1) which supported multiple "rotation" (i.e. camera tumble) modes. Below, the sphere becomes "corrugated", the first step in the eversion. Next, the north and south poles are pushed through each other. Here one eighth of the sphere has been cut away to reveal some of the interior. Next, the corrugations are twisted 180°, and the sphere starts to deflate. Here some of the surface is cut away. During deflation the interior becomes very complex. This is a zoom-in on the equatorial cross-section (the southern hemisphere has been cut away). Here, seven eighths of the sphere have been cut away, leaving a single "strip". It is easier to visualize the full eversion if one first studies a single strip as twists and turns inside out.